Added by admin on July 16, 2018. 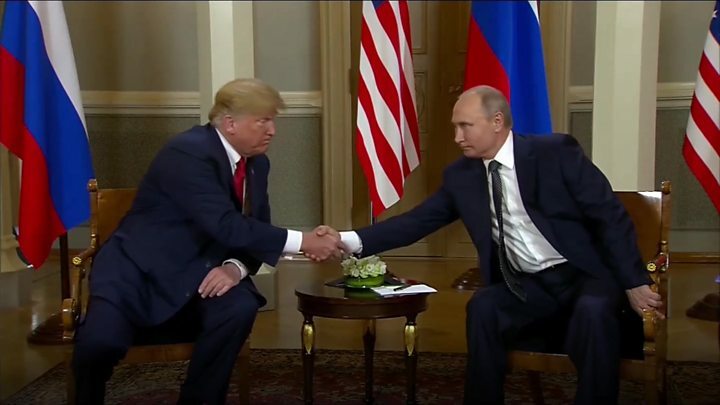 Media captionThe moment President Trump meets counterpart Vladimir Putin. US President Donald Trump has said getting on with Russia is “a good thing, not a bad thing” at the start of his first summit with Vladimir Putin. Mr Trump said he hoped for an “extraordinary relationship” as the two presidents met in Helsinki, Finland. Relations were severely strained by Moscow’s annexation of Crimea in 2014 and by claims that Russia helped Mr Trump win the 2016 election. But writing on Twitter, Mr Trump put the blame for the deterioration in relations with Russia on “years of US foolishness and stupidity and now, the Rigged Witch Hunt”. Mr Trump’s tweet is likely to alarm White House advisers already nervous about the risks of ceding too much ground to the Russian leader during the talks. The summit – in which the two leaders are being joined only by their interpreters – comes after a tumultuous European tour that saw Mr Trump sharply criticise longstanding allies of the US over trade and military spending. Mr Trump has consistently denounced the inquiry as a “witch hunt”. The 12 Russians indicted on Friday were targeted as part of Mr Mueller’s investigation. Top Democrats including party chairman Tom Perez urged Mr Trump to cancel the talks, saying Mr Putin was “not a friend of the United States”. What is being discussed at the summit? US National Security Adviser John Bolton has said that both sides have agreed the meeting will have no set agenda. But he said he found it “hard to believe” Mr Putin would not expect the alleged election hacking to be brought up. His tour has included a Nato summit in Belgium and a visit to the UK. Neither passed without controversy. 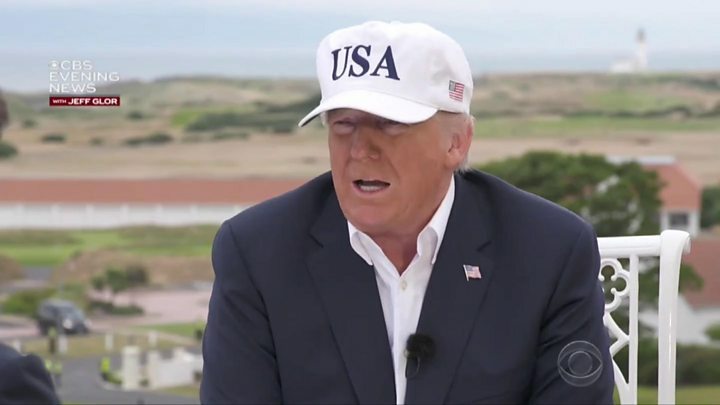 Following the Nato summit, Mr Trump said the allies had pledged to “substantially” raise their defence budgets but other leaders cast doubt on this claim.